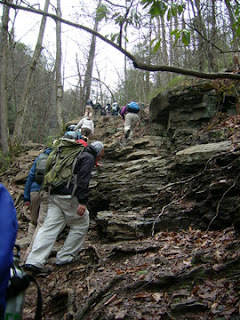 I spent the entirety of Saturday out with 25 Philly-area residents hiking around Glen Onoko Falls. All of us are members of the Philadelphia Hiking and Adventure Group, and a handful of participants used the day as part of their training regimen for the Inca Trail. Our fearless leader, Julius Geday is the type of many you’d expect to see on the top of Mt. Rainier encouraging his hiking buddies to speed back down the mountain and do it again, just because. Jules and the rest of the Peruvian-bound team, sporting 40-pound packs, determined the training day would be fruitless unless we completed the 1.7 mile loop four times. Even with just my small day pack and water, it was a long day. While all of the 20-somethings in Philly were out drinking, laughing, and staying up late, I was sound asleep. Sunday morning came, and I had planned a day of climbing in Birdsboro with friends from the rock gym. 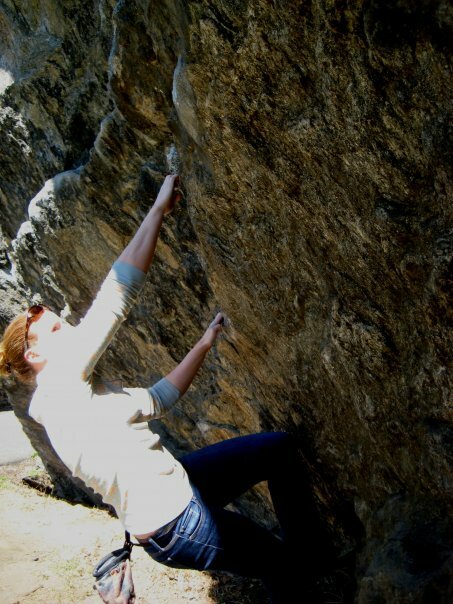 It would be an educational trip for me – more leading, more anchor-setting, more lead belaying, etc. When my alarm went off, I glanced over at Dan, still fast asleep after working from 3pm to 3am. His 3pm to 11pm shift Sunday would prevent him from climbing outdoors with me – again. His schedule as of late has kept him from doing a significant portion of the fun things I do, as he never gets weekends off, and works through the evenings. While I’m at the rock gym, out to dinner, or out on a hike, he’s at work. So, I made the decision to forgo a day of leading and toproping, and instead biked with Dan down to a little bouldering spot we’d heard about along the Schuylkill River Trail. We goofed around, made up our own problems, and spent a wonderful three hours playing outside. I've come to understand that my life consist of a series of decisions, with each decision contributing to maintaining a balance. I balance work, play, friends, family, my wallet, my various recreational activities, Dan, and a million other things I can’t think of at the moment. If any one of these things receives too much, or not enough attention, I don’t feel right. Deciding to skip a potentially awesome day of leading outdoors and to go bouldering near home instead was a good decision, a decision that kept me in balance. If I don't spend enough time outside, my internal balance falters, which means I'll often make decisions that keep me out of bars with my friends, and in bed resting up for a day, or weekend, of hiking or climbing. This hasn't always been the case, but for some reason, it is at the moment. I've found this to be an extremely difficult balancing act; I always enjoy nights out with friends, regaling each other with tales of god knows what over a glass of wine, or dancing our pants off. But I've found myself sacrificing more of those nights out for the sake of keeping my balance recently, which, on occasion, makes me feel antisocial and left out. The bottom line – we are all involved in an incredible balancing act. What does yours look like? Great post. I often am asleep by 10 on weekends as I know the next day will bring sunshine, fresh powder or a morning bike ride to breakfast. But at the same time, I also need the balance of staying in my pjs until noon with a cup of coffee and a good book. I think there is an art to successfully balancing. Juggling is an example of balance gone right. I've been working on my balance for awhile, but haven't yet managed the art, yet i wnat to keep bringing in more things to balance. I geuss it's a personal thing how well you percieve yourself to be balancing and being in good communication with the people in your life, so you can get a real perspective. I'll tell ya one thing, I wish I kept my balancw before In hit 37, so keep it up. Btw where's your helmet, girl? I've had a lot of discussions with climbing friends about how hard it is to keep "normal" friends. I definately feel more comfortable in a lifestyle that doesn't include going out to bars or drinking much at all. It feels healthier to me. But for so many of my friends, that is their normal weekend activities. And they'd much rather spend the weekend bar hopping than sleeping in the desert. I've found that, unfortunately, those lifestyles just don't seem to mesh very well. And I've lost a few friends over the years to this very problem. Kate - It's such a hard balance, isn't it? I don't like being left out of nights out, but then when I am invited, I'm usually the first one to leave. And you're right, the lifestyles don't quite mesh. For now, I'll just have to keep trying!